Jalazone Refugee Camp near Ramallah started in 1948 with 3,500 people, it now houses around 15,000 residents. The Camp occupies 2 square kilometres, the same as it did when set up in 1948. Schools for Camp children, run by UNWRA (United Nations Works Relief Agency) have had to be built outside the camp, which in itself presents problems as there is an Israeli Settlement, Bet El, just on the outer boundary of the Camp. There is a great deal of tension between the Camp’s residents and those of the Settlement. Since 2014, ABCD has worked closely with the Jalazone Governing Committee to set up paediatric rehabilitation programmes to addressing these needs with special attention being paid to those under 6 years. ​ABCD have refurbished and extended treatment areas and provided up to date equipment. We are also paying the salaries of two therapists, whose enthusiasm and determination to improve the quality of life in the camp is outstanding. ABCD has also been able to fund, equip and support the running of an incredible new sensory room. 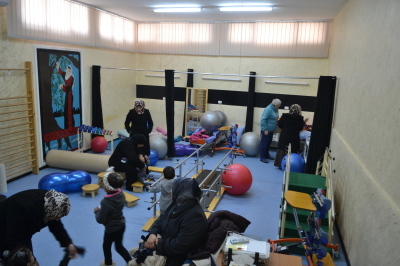 This space is hugely beneficial in the realising of holistic rehabilitation, with the ability to create unique sensory environments adapted to the needs of the child. ​All refugee camps fall outside the Palestinian Authority's remit so there is little by way of state assistance and prior to ABCD's involvement, there were no other external agencies working in the camp apart from UNWRA. Unfortunately, because of the escalating conflict in the Middle East, UNWRA's funding is under threat and they have had to cut back their financial aid to all camps in the West Bank by 65% leaving a gaping hole in the service provision for vulnerable children. ​​Life for refugee children in this camp is particularly harsh. Unemployment stands at 60%, there are high levels of disability, with limited services in place to address this. The supply of water to the camp is often rationed, and extreme poverty and overcrowding prevail. The Centre for the disabled, at that time, was in poor condition with very limited equipment, it was in dire need of refurbishment and equipment. The Centre had on it's books 140 ambulatory cases, 70 with mental disability, 24 with hearing issues and 150 with visual impairment. Autism has been diagnosed only recently and is an increasing problem.​ ​​There are a growing number of children in need of trauma counselling - many are injured and disabled from gunshot wounds.